Since then, the majority of Koreans migrated and settled in the region of the Korean Peninsula, where there have been more than a thousand recorded instances of foreign invasions. 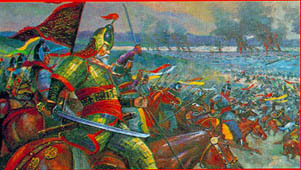 Consequently, the Korean people developed unique martial arts and military strategies in order to defend themselves and their territory. Most of these Korean martial arts fall into three main groups or branches, namely tribal, Buddhist, and royal court martial arts. SahDoh MuSool was popular among the ancient tribes, city-states and smaller kingdoms that formed in the Korean Peninsula and parts of what is now China. This was evident well before the first unified Korean kingdom of Ko-Cho Sun which was founded in 2333 BC by the legendary king, DahnGoon WahngGuhm. Later, SahDoh MuSool was further developed and made widespread by voluntary militias comprised of the common people, who often fought in battles to defend their villages. Traditional athletic activities such as Taekkyon, and Ssireum are considered to have originated from SahDoh MuSool. In fact, many techniques found in the popular Olympic sport of TaeKwonDo can also be traced back to SahDoh MuSool. Since Buddhism was first introduced to the kingdom of Koguryo in the year 347, a rather unique form of martial arts was developed by both Buddhist monks as well as martial artists, known as BoolKyo MuSool. Buddhist monks originally developed and then practiced BoolKyo MuSool to improve their health while meditating and to defend themselves while traveling. As a result, Buddhist martial arts include both internal training, with emphasis on special breathing and meditation methods, as well as external training, with emphasis on extremely effective self-defense techniques. Many Buddhist monks were so accomplished as martial artists that they were occasionally called upon during national emergencies to fight in battles by forming unprecedented armies of warrior monks. To this day, BoolKyo MuSool plays a significant role for Korean martial artists by providing them with philosophies of non-violence and compassion as well as ethical codes of conduct, such as the famous Five Precepts of the HwaRang warriors. Kings, royal families and government officials had private armies and bodyguards who practiced a type of martial art known as KoongJoong MuSool. These royal court martial arts gave rise to esoteric techniques of easily portable weapons such as short swords and folding fans. Also developed were unique weaponless techniques of joint-locking and pressure point striking. Existing records in Japan suggest that many KoongJoong MuSool techniques found their way there and gave birth to the Japanese art of Jujitsu. King JinHung of the Kingdom of Silla encouraged the HwaRang warriors to practice KoongJoong MuSool in addition to their other martial arts training. But later during the Koryo Dynasty and Chosun Dynasty, Korean kings enforced policies to discourage the practice of martial arts and to forbid the possession of weapons, in order to protect themselves from military rebellion or any other political uprising. 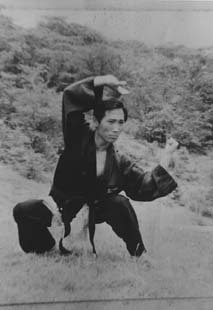 However, Korean martial arts have continued to develop both within and without the royal courts, thanks to the efforts of many dedicated Korean martial artists to practice, record, and compile these precious martial art techniques. Kuk Sool has countless techniques derived from the three branches of traditional Korean martial arts and is structured to take a practitioner in a logical progression from the beginning all the way up to Master level. Kuk Sool Won™ has been actively promoted worldwide by the World Kuk Sool Association®, and it is also recognized in the martial arts community as one of the most effective and comprehensive systems of traditional Korean martial arts in existence today. For more information about Grandmaster In Hyuk Suh or the organization he founded, please visit the Founder's Section.